The Margraviate of Austria was a southeastern frontier march of the Holy Roman Empire created in 976 out of the territory on the border with the Principality of Hungary. Originally under the overlordship of the Dukes of Bavaria, it was ruled by margraves of the Franconian Babenberg dynasty. It became an Imperial State in its own right, when the Babenbergs were elevated to Dukes of Austria in 1156. Map of the Margraviate of Austria within the Duchy of Bavaria circa 1000 CE. 1: Also Dukes of Bavaria from 1139. The first mention of the word Ostarrîchi is in this document, the word is marked with a red circle. In contemporary Latin, the entity was called the marcha Orientalis ("Eastern march"), marchia Austriae, or Austrie marchionibus. The Old High German name Ostarrîchi first appeared on a famous deed of donation issued by Emperor Otto III at Bruchsal in November 996. The phrase regione vulgari vocabulo Ostarrîchi, that is, "the region commonly called Ostarrîchi", probably only referred to some estates around the manor of Neuhofen an der Ybbs; nevertheless the term Ostarrîchi is linguistic ancestor of the German name for Austria, Österreich. Later the march was also called the Margraviate of Austria (German: Markgrafschaft Österreich) or the Bavarian Eastern March (Bayerische Ostmark, the second word being a German translation of marcha orientalis, though no example of this usage in relation to Austria is known before the 19th century) to differentiate it from the Saxon Eastern March (Sächsische Ostmark) in the northeast. During the Anschluss period of 1938–45 the Nazi authorities tried to replace the term "Austria" with Ostmark. The march comprised the lands north and south of the Danube river, with the Enns tributary in the west forming the border with the Traungau shire of the Bavarian stem duchy. The eastern frontier with the Hungarian settlement area in the Pannonian Basin ran along the Morava (March) and Leitha rivers, with the Gyepű borderland (the present-day Burgenland region) beyond. In the north, the march bordered on the Bohemian duchy of the Přemyslids, and the lands in the south belonged to the Dukes of Carinthia, also newly instated in 976. The early march corresponded closely to the modern region of Lower Austria. The initial Babenberger residence was probably at Pöchlarn on the former Roman limes, but maybe already Melk, where subsequent rulers resided. The original march coincided with the modern Wachau, but was shortly enlarged eastwards at least as far as the Wienerwald. Under Margrave Ernest the Brave (1055–1075), the colonisation of the northern Waldviertel up to the Thaya river and the Bohemian march of Moravia was begun, and the Hungarian March was merged into Austria. The margraves' residence later was moved down the Danube to Klosterneuburg until in 1142 Vienna became the official capital. The Babenbergs had a defense system of several castles built in the Wienerwald mountain range and along the Danube river, among them Greifenstein. The surrounding area was colonized and Christianized by the Bavarian Bishops of Passau, with ecclesiastical centres at the Benedictine abbey of Sankt Pölten, at Klosterneuburg Monastery and Heiligenkreuz Abbey. The early margraviate was populated by a mix of Slavic and native Romano-Germanic peoples who were apparently speaking Rhaeto-Romance languages, remnants of which remain today in parts of northern Italy (Friulian and Ladin) and in Switzerland (Romansh). In the Austrian Alps some valleys retained their Rhaeto-Romance speakers until the 17th century. The first marches covering approximately the territory that would become Austria and Slovenia were the Avar March and the adjacent March of Carantania (the later March of Carinthia) in the south. Both were established in the late 8th century by Charlemagne upon the incorporation of the territory of the Agilolfing dukes of Bavaria against the invasions of the Avars. When the Avars disappeared in the 820s, they were replaced largely by West Slavs, who settled here within the state of Great Moravia. The March of Pannonia was set apart from the Duchy of Friuli in 828 and set up as a march against Moravia within the East Frankish regnum of Bavaria. These march, already called marcha orientalis, corresponded to a frontier along the Danube from the Traungau to Szombathely and the Rába river including the Vienna basin. By the 890s, the Pannonian march seems to have disappeared, along with the threat from Great Moravia, during the Hungarian invasions of Europe. Upon the defeat of Margrave Luitpold of Bavaria at the 907 Battle of Pressburg, all East Frankish lands beyond the Enns river were lost. Duchy of Bavaria in 976. In 955 King Otto I of Germany had started the reconquest with his victory at the 955 Battle of Lechfeld. 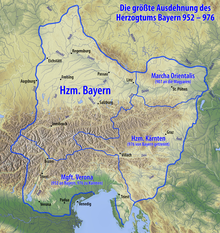 The obscurity of the period from circa 900 until 976 leads some to posit that a Pannonian or Austrian march existed against the Magyars, alongside the other marches which had been incorporated into Bavaria by 952 (Carniola, Carinthia, Istria, and Verona). However, much of (Lower) Pannonia was still conquered by the Magyars. In 976, during a general restructuring of Bavaria upon the insurrection of Duke Henry II the Wrangler, Otto's son and successor Emperor Otto II had a new marcha orientalis erected on the territory of the former Pannonian march. He appointed the Babenberg count Leopold the Illustrious from the House of Babenberg margrave in turn for his support. Leopold replaced one Burchard, whose status is not well known but may represent a continual margravial authority in the region during the interval 900–976. Margravial Austria reached its greatest height under Leopold III, a great friend of the church and founder of abbeys. He patronised towns and developed a great level of territorial independence. In 1139, Leopold IV inherited Bavaria. When his successor, the last margrave, Henry Jasomirgott, was deprived of Bavaria in 1156, Austria was elevated to a duchy independent from Bavaria by the Privilegium Minus of Emperor Frederick Barbarossa. From 1192 the House of Babenberg also ruled over the neighbouring Duchy of Styria. The line became extinct with the death of Duke Frederick II of Austria at the 1246 Battle of the Leitha River. The heritage was finally asserted by the German king Rudolph of Habsburg against King Ottokar II of Bohemia in the 1278 Battle on the Marchfeld. ^ The March of Moravia as a separate entity came into existence in 1182. There was no colonisation in Moravia run by Austrian dukes in 11th century (nor later). In the first half of 11th century Moravia was conquered from the Magyars and Poles and reunited with Bohemia by prince Oldřich. Semple, Ellen Churchill (1915). "The Barrier Boundary of the Mediterranean Basin and Its Northern Breaches as Factors in History". Annals of the Association of American Geographers. 5: 27–59. doi:10.1080/00045601509357037. Reuter, Timothy (1991). Germany in the Early Middle Ages 800–1056. New York: Loman.